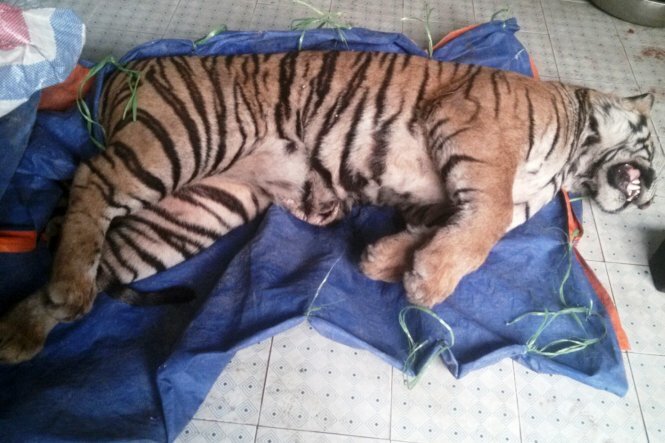 The frozen tiger seized by police in the central province of Nghe An on January 20, 2015. Vietnamese police have detained two men for illegally transporting and stockpiling one tiger and eight monkeys, all frozen, in the central province of Nghe An. Provincial police on Sunday said they were waiting for identification results of the dead wild animals they seized from Nguyen Dac Sung, 51, and Nguyen Dac Phu, 19, two local men, last week. Sung and Phu will be charged with breaching regulations on the protection of precious and rare wild animals. The two men were arrested on January 20 after being caught carrying three frozen monkeys weighing 30 kg in total packed in two sacks, said senior lieutenant colonel Luong The Loc, chief of police of Thanh Chuong District. Both men failed to show police any documents to prove the origin of the wild animals. Based on their testimony, police raided the house of Phu’s mother – Nguyen Thi Nhuong, 45 –in the district’s Thanh Van commune and discovered five more dead monkeys weighing 70 kg in total and one dead tiger weighing 140 kg in a large freezer. Nhuong told police an unknown young man in the province’s Dien Chau District offered to sell to him the dead tiger and eight dead monkeys for VND150,000 (US$7) per kilogram of monkey and VND5 million ($234) per kilogram of tiger. Nhuong then bought the monkeys only as he did not have enough money to buy the tiger. Nhuong and the young man then agreed that if Nhuong could help sell the tiger for the above price, the young man would pay him VND20 million ($937) as remuneration. Currently, all the dead wild animals are being preserved at the Thanh Chuong district police office, police chief Loc said. On December 22, 2014, police in the same province also confiscated a frozen dead tiger, weighing 120kg, from a local man, Nguyen Van Lap, 34, who was illegally transporting it in a car on National Highway 1. Earlier this month, police in the northern province of Bac Kan arrested Nguyen Van Duoc, 51, director of the Bac Kan Trading and Hotel Co. Ltd. for illegally procuring a large dead tiger,an endangered wild species, to make bone glue. Duoc was detained after investigators concluded that he was the owner of five separated parts of a big tiger that was discovered in a truck at the Bac Kan Hotel, owned by Duoc, in Duc Xuan Commune on January 15. Some believe that tiger bone paste treats a variety of ailments, including rheumatism, though there is no scientific basis for this. According to the International Union for Conservation of Nature’s Red List of threatened species, tigers are classified as “endangered,” with the current global wild tiger population estimated to be around 3,000 individuals. The illegal trade in high-value tiger products including skins, bones, meat, and tonics is the primary threat to tigers, according to IUCN.